Many people set their dog up for failure and don't even realize it. A dog is very in tune to its owner, sensing what the owner anticipates will happen and how the owner feels about it. 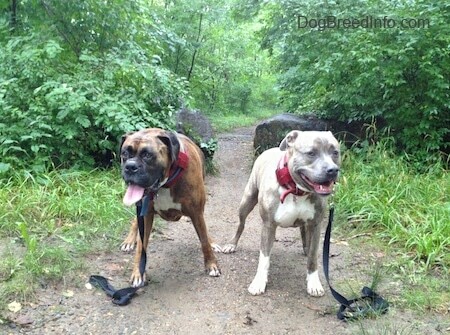 An example: While out on a walk, two packs are passing one another. One of the humans has a dog that acts out when it sees other dogs. The human anticipates this bad behavior beforehand and reels her dog in from being in front of her to next to her. The owner begins to say to her dog, “It's OK, it's OK,” in a sweet voice. The owner stops the dog from walking and moves off to the side to allow the other pack to pass as she continues to sweet-talk the dog, “It's OK, it's OK.” What the human is thinking is “I know you are going to act out. It's OK. I'll deal with your bad behavior.” What the dog hears is “Good dog. I like how you focus on the other pack and how you are about to behave.” The human does not want to give the dog any negative vibes. She says it's OK as the dog goes crazy pulling, barking and growling at the passing pack. This dog knew the owner expected it to act out. The dog gave the owner what she had anticipated and the dog was told it was a good dog, it's OK. Meanwhile the other pack is passing with two dogs. The other owner sees a different story in her head. She is imagining passing the crazy dog with no issues. She thinks to herself and quietly says out loud to her dogs without even realizing it, "Don't even think about reacting to that dog." The image of passing with well-behaved dogs is still in the owner’s head. The dogs had been heeling on the leash from the moment they left for the walk, therefore in the dogs’ minds, they were never in charge on this walk and are in tune to the human with the leash. Despite passing a dog that is going crazy pulling, barking and growling on a narrow trail, her dogs pass only glancing at the crazy dog. Why? What is the difference between these two situations? The dogs in this pack know it is NOT OK to act up and they know they are expected to behave. They were never in charge and had a follower mind-set; whereas the other dog knows just the opposite. Both packs are doing exactly what their owners expect of them. I see this situation all of the time while out on walks. An owner sees another dog coming and anticipates the worst. They stop their dog and get them off to the side, sometimes popping treats in the dog's mouth in hopes of distracting it and associating passing another dog with a positive food reward. Sometimes this works in getting the dog to not react, but if you are dealing with a stronger-minded dog, passing other dogs is always going to be a big ritual ordeal. A dog without leadership is more likely to be unpredictable. I prefer to avoid the ordeal and not have a ritual. I do not want to worry about having a food reward. I just want to be on my way and pass other dogs and humans calmly and without having to think much about it. Some argue dogs should be treated as equals and the dog’s feelings should be considered. People often think it is negative training to just expect good behavior without a reward. But what is more humane? In my many observations, the dogs that are treated as equals without leadership are anxious dogs. The owners sweet-talk and pop treats to the dog. The rules are often unclear because it is rare that they are ever told no. The dogs that have leadership behave without having to be distracted. They are more relaxed and calm. Since they are not in charge they do not have to worry about controlling things around them. I am here to vouch that it is OK to expect good behavior from a dog without a reward. It is OK to tell a dog no. Even human kids need guidance and leadership. The best behaved children have parents who do not pop them candy and cookies or promise them toys just for behaving in public—it is expected. The best part is the dogs that behave because they know that it is just expected of them do get rewarded. The dogs feel the pride and satisfaction coming from their owners. Their minds are calmer and they are more often relaxed. They often get to go out in public more because their owners can trust them. If you ask me, that type of reward is better than a chicken-flavored cookie.